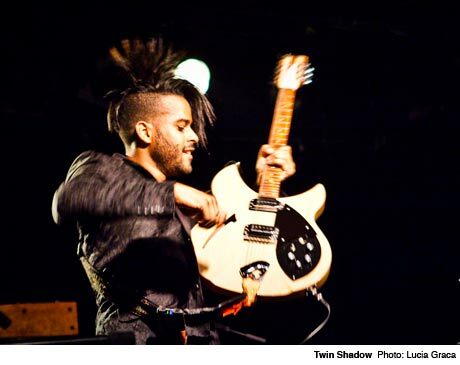 For all of its pretty claustrophobia, Twin Shadow's debut, Forget, kept listeners at arm's length, and that balance gave it much of its appeal: it was heady yet accessible, intimate but exclusionary (think of a WB Network, hot/cold high-school romance). Conversely, follow-up Confess upped the tempo enough to at least seem welcoming (as long as you disregarded the dark shadows that lurked about). The live show is a different beast entirely. For the first of a two-night Toronto stand, George Lewis Jr. and co. cranked up, well, almost everything. Early on, "Tyrant Destroyed" tipped off the more-is-more M.O. with a hotter-than-July-pavement mix. "At My Heels" aimed for the ceiling and "Run My Heart" was awash in skyscraping vocals and big synths. Similarly, "I Can't Wait" injected its breakdown with sonic steroids (a recipe for dancing if ever there was one). The results were unsurprisingly raucous, though without totally sacrificing the albums' finer points. Evidently, the purpose of translating tracks into bigger versions wasn't just for the joy of tinkering or the excitement of an all-in crowd. Instead of just circumventing expectations, sped-up, enlivened cuts added an esoteric layer that winked at fans of the records while giving them -- and everyone else, for that matter -- an excuse to get sweaty on a Monday night. Presumably, they were also fun as hell for the polished four-piece to play. "Slow" best encapsulated the ethos, pitting an unrelenting rhythm against twinkling keys. Realizing its futility, the latter eventually went ballistic, giving into and relishing in the gig's primal quality. And at the centre of it all was Lewis. As anyone weaned on '90s pop culture can tell you, the appearance of effort is lame (see Michael Jordan and, to a lesser extent, Troy Dyer), and the frontman/mastermind was cooler than Van Damme in Timecop. Whether showing off guitar chops on "Shooting Holes" and "Forget" or playing with his vocal range, Lewis kept the aural bluster in check. And he wisely chose not to sniff a stranger's boxer shorts.